The Home is hosting a cat & kitten adoption evening from 4.00pm-9.00pm on Wednesday 12 July. Calling all cold humans in Melbourne! We’re hosting the ultimate winter warmer. Our cats and kittens (aka Purr Agents) are on a mission to rescue you from the winter chill. 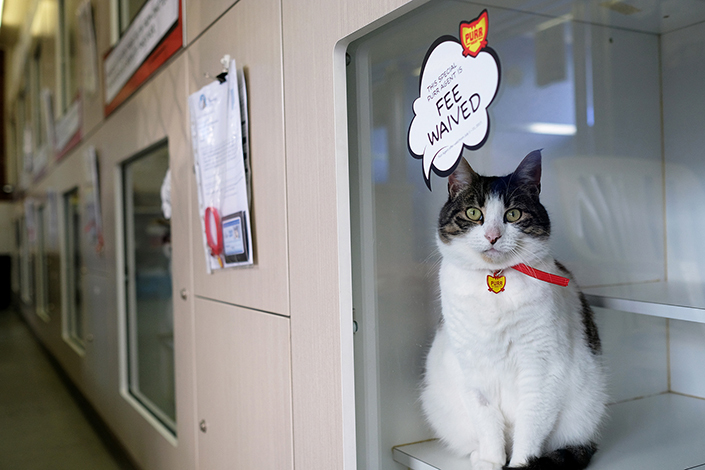 Come along to our Purr Agent adoption evening on Wednesday 12 July from 4.00pm-9.00pm and adopt a cat for no fee or kitten for half price. Lap-warming and snuggles are guaranteed. We’re extending our cat and kitten adoption hours for one night only! It’s school holidays, so round up the family and join us for a fun evening of tasty winter treats, prize giveaways, photo props and most importantly… adopting your Purr Agent. Get into the theme of the evening and come dressed as a special agent or cat – don’t be shy! You’ll receive 10% off vet bills at our Frank Samways Veterinary Clinic for your adopted pet, valid until June 2018 (Ts & Cs apply). We look forward to seeing you at the Purr Agent Headquarters (i.e. our adoptions centre). Your Purr Agent awaits, and their mission starts with you! Please note: Extended opening hours are for cat and kitten adoptions only. All other services (eg. dog adoptions, pet reclaims, veterinary clinic) will close at their normal times.